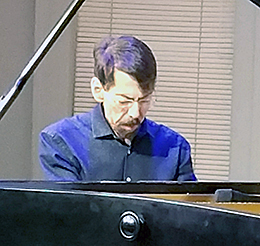 Pianist Fred Hersch played two solo concerts at Kerrytown Concert House in Ann Arbor on March 27. I had the privilege of attending the second one and it was a real treat for any piano fans since he is one of the true masters of the keys with impeccable touch and taste. Hersch kicked off with two originals, “Plain Song” and “Duet,” and moved on to his first of many from the American Song Book, “Embraceable You.” Others were a swinging version of “After You’ve Gone” and “The Nearness of You” with a ravishing statement of the melody. Jazz standards like Gillespie’s “Con Alma” and Monk’s “Round Midnight”/”Blue Monk” were also given just the right combination of swing and soul. Hersch remarked that including Monk keeps you honest, and if that means that not everyone can show reverence to the composer and deliver a personal interpretation as well, we got just that in this concert. Hersch also showed his appreciation of more contemporary popular song by including pieces by Paul McCarthy, Joni Mitchell, and Billy Joel. In all, a very memorable evening!